Happy first Tuesday of 2017!! I hope your year is off to a great start. I turned 30 at at the end of 2016 and this week I am sharing a little review of some of those celebrations. 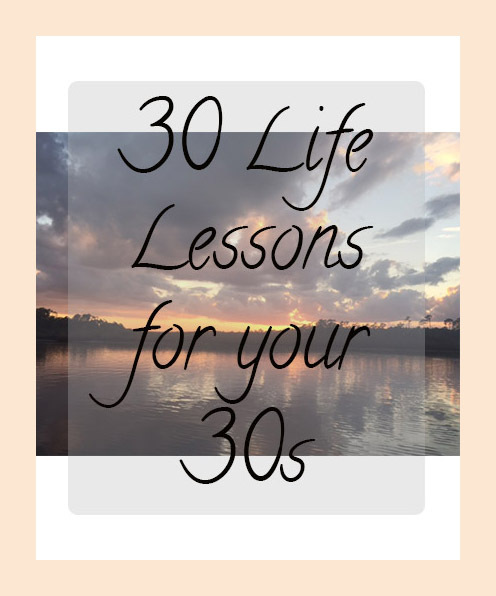 I figured I would kick it off with some of the things life has taught me the last 30 years. Life is an ongoing learning process and each day- each year- teaches us more of who we are and the kind of person we want to be. 1.) Age is just a number! That has never felt more real than it does now. 2.) Life will change you; let it! I never much liked change, but I have learned to embrace it, because it’s going to happen no matter what you try to do to prevent it. If someone had asked me when I turned 20 where I planned to be when I was 30, the answer would have been very different from where my life currently is. And I am more than ok with that! 3.) Throw the list away! All the checklists, the pictures you draw and plans you lay that you will just be devastated by if they don’t happen by such and such date, just chuck them. If you cling too tightly to them you don't allow yourself the space to just live. 4.) People are people; we all have hurts and hang-ups, so let’s all just cut each other some slack. 5.) People need people! As much as I enjoy time to myself- which I actually enjoy more and more the older I get- I have also become increasingly aware that we can’t make it through this life alone. We need people to lean on and we need to be a place that they can lean when needed. 6.) Life is hard; don't take it too seriously or it will seriously take you! 7.) Just be kind! I think those three little words hold so much. 8.) Relationships are work; but they are worth it. True friendships, spouses, parent/ child, siblings… they all require a sacrifice of self in some way, they mean being part of somebody else’s messy moments, but they also mean sharing your mess in return. Having someone to help you carry your heavy is so very, very worth it! 9.) Finding yourself will happen over and over again! The person I am today is so different than the person I was even 5 years ago. It don’t think it means I never knew who I was, I just think it means that throughout a lifetime we can be so many different things. The things I will experience between here and my 40s will probably mean the picture will be even more changed by then. I’m ready for it! 10.) Give yourself grace! You’re only human, you will make mistakes, forgive yourself! 11.) A smile has a way of catching! Share them freely! 12.) Find what you love and make time to do it as often as you can!! 13.) Some things won’t ever make sense, so don’t even try to understand them- it will just make you so much more confused! 14.) There will always be something that needs to be done, it’s ok to leave time to shut-off for a while and just rest! 15.) You don’t owe anyone anything- yes, we should be kind; yes, we should care for others. We should be giving and generous, but at the end of the day you are only in charge of yourself, don’t let other peoples choices define anything about who you are or take any ounce of happiness from you. 16.) Hold the people you love close, you never know when it might be the last time you see them. 17.) Forgiveness can sometimes be hard to give, but it’s heavier to hold onto. 18.) A partner who gives you freedom to be yourself is greater than gold! 19.) Marriage is no different than life, it has it’s hard days and it’s easy ones; let the easy ones define who you are as a couple! 20.) Never stop dating! Plan things that you both love and make time to do them. And, every so often, do something that only the other person enjoys; their smile will make you love it too! 21.) Alone time is needed!! Take yourself on dates, just you. Remind yourself why you LOVE being you! 22.) Don’t apologize for being who you are! There are going to be people you just don’t mesh with and that’s ok, but don’t ever make excuses for who you are because someone doesn’t agree with your choices. Simply agree to disagree and move on. 23.) Don’t compare! With all the avenues of social media, this has never been more true. You never know the struggles someone is facing behind that glittering, perfectly-filtered door. 24.) Don’t judge someone on their down days; really just don’t judge period! Give people the freedom to just be. 25.) The real world is better! I can be the absolute worst with my phone, with scrolling Insta and FB, but making more of a point to put the phone down always reminds me that looking up is so much more bright and beautiful. 26.) There is so much of the world to explore! Try to enjoy as much of it as you can! 28.) There is always hope! 29.) Look for the beauty around you- in the world, in people. It’s always there; in the helping hands, in the sunshine after the rain, sometimes even in the rain itself. The way we choose to see the world is what it will become for us. 30.) Always remember how truly beautiful you are! You were made specifically for this time right now, don’t forget that! What has life taught you up to now? Happy belated birthday. life has taught me that anything you want takes work because nothing is handed to you. And yes, that's a good one to remember too!! Happy birthday to you! Looks like you've learned lots of valuable lessons over the years!